The Pleiades – also called the Seven Sisters in English – is the best-known star cluster in the sky. It's shown on Babylonian clay tablets, star catalogs dating back six thousand years. 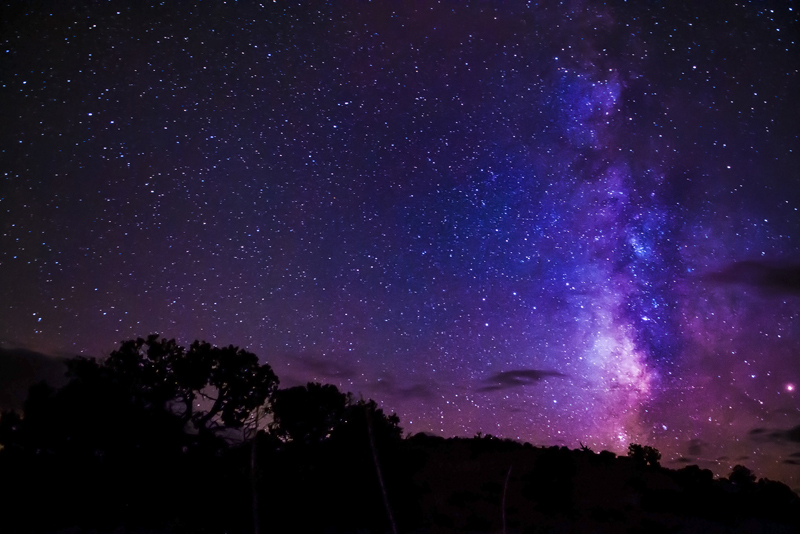 Visible from northern and southern hemispheres, probably every culture that ever watched the sky has had a name for it. But what is this group of stars? And are there actually seven of them? In the ancient Greek myths there were seven Pleiads, the daughters of Atlas and Pleione. Atlas was the Titan condemned to hold the Earth on his shoulders after leading a war against the gods. 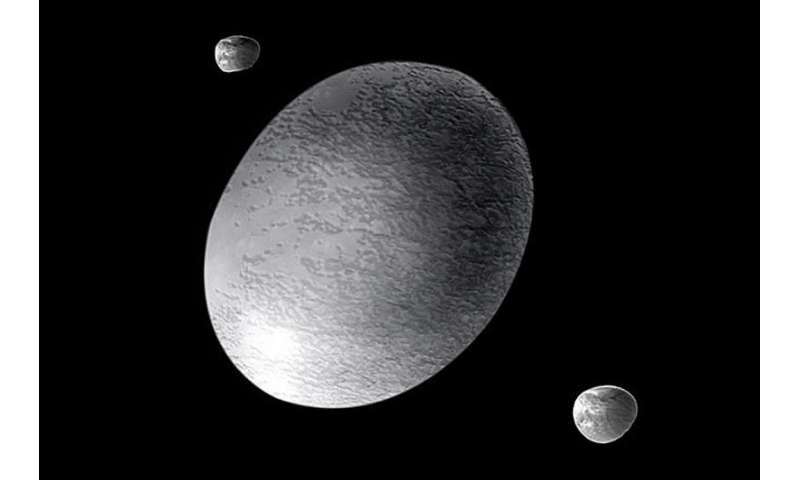 Pleione, an oceanid nymph, was the daughter of the Titans Oceanus and Tethys. 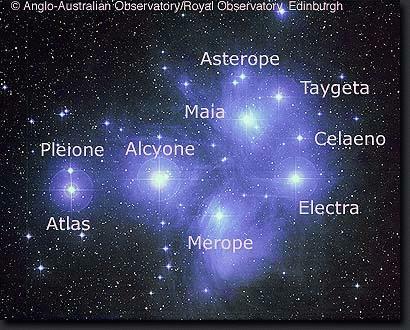 The seven sisters were called Alcyone, Asterope, Celaeno, Electra, Maia, Merope and Taygeta. Confusingly, by now there are stars named not only for the seven sisters, but also for their parents. That would make nine. Although traditionally there are seven stars, without binoculars you probably won't see more than six. Often you can't even see that many, though some people with sharp eyesight have seen up to fourteen in good viewing conditions. Even in times past people could only see six stars, so there were also stories about a missing sister. Some say it was Electra, whose son founded Troy. She hid herself away in sorrow after the city's destruction. Others say it is Merope who hides in shame as the only one who married a mortal. Tales of a lost seventh member of the group occur in the star lore of many cultures around the world. In some places the cluster is traditionally represented by only six stars. For example, in Japan the cluster is called Subaru - the car manufacturer of that name has a logo with six stars. The Pleiades is an open star cluster in the constellation Taurus. It has at least a thousand stars in it. Open clusters are made up of stars that formed from the same giant nebula at about the same time. The Pleiades cluster formed about a hundred million years ago. Since the stars are only loosely held together by gravity, its members will gradually break away under the influence of the gravity of other bodies. The stars are hot young stars. You may wonder about young stars being a hundred million years old. This is hardly young in human terms. A hundred million years would take us back to a time when dinosaurs – not humans – dominated the Earth. However in star terms a hundred million years is juvenile. The Sun, for example, has already been around for fifty times that long and is only about halfway through its life. The stars that we see in the Pleiades don't seem particularly bright. That's because they are over 400 light years away. The brightest of them, Alcyone, is a blue-white giant a thousand times more luminous than the Sun. Even Alcyone's faintest sister is much brighter than our own star. Although the beautiful blue-white stars are the main feature of the cluster, they aren't alone. Up to a quarter of the cluster members are brown dwarfs. Despite their numbers, their mass is less than 2% of the total. They are so dim that they are best detected in the infrared. A brown dwarf is a failed star, a body more massive than a planet but not massive enough to sustain hydrogen fusion. The first-ever confirmed brown dwarf was found in the Pleiades cluster in 1995. It was named Teide 1. A photograph of the Pleiades cluster shows a certain amount of nebulosity. Like everything else in the Galaxy, the Pleiades are on the move, and they are now in a rather dusty region of space. Starlight reflecting off the dust forms a reflection nebula, particularly noticeable around Merope. A reflection nebula is always blue, because dust tends to absorb the redder wavelengths of light and scatter the blue. In the northern hemisphere the Pleiades cluster is easily visible on clear nights from late autumn through early spring. One easy way of finding it is by starting with the belt of Orion. 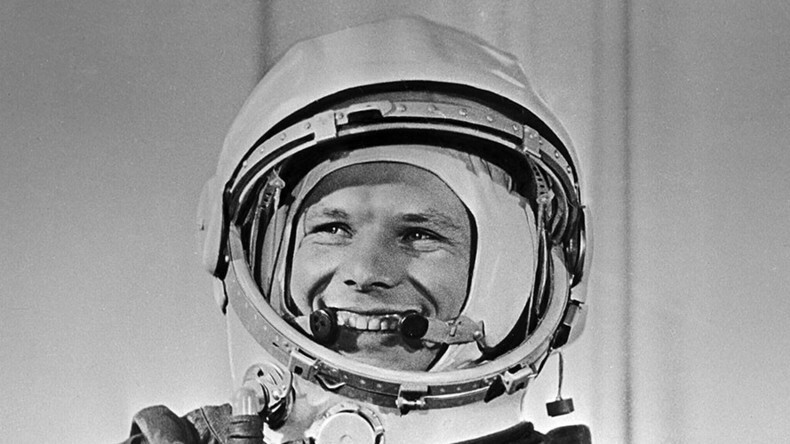 Imagine a line following the belt stars upward. The line passes just below reddish Aldebaran (the eye of Taurus) and then on to the Pleiades cluster near the upper right edge of the photograph. By the way, as the imaginary line passes under Aldebaran, it goes across the V-shape in Taurus which is the Hyades cluster. In Greek mythology the Hyades were also seven in number and sisters to the Pleiades. It's surprising that the Pleiades cluster is listed as M45 in the Messier catalog. Charles Messier, an eighteenth-century astronomer, cataloged a number of fuzzy objects which might be mistaken for comets. But I really can't imagine anyone mistaking the Pleiades for a comet.